Great article Katrin and lovely pancakes. We start our children off every school morning with eggs, cheese, sausage and a serving of whole fruit (never juice). We started this because we have a child on the Spectrum and noticed that we could avoid the mid morning hangries when we fed our children less sugar for breakfast. I wonder if those sugar counts you mention above from Public Health England even took into account the amount of sugar that grains and starches convert into in our bodies? While Sam was in the hospital last week he was served oatmeal with brown sugar, toast with jam, juice, milk and an egg (sugar, sugar, sugar, sugar, protein plus fat). When the hospital nutritionist asked me what I fed my children for breakfast at home, she was aghast that they didn’t receive any “whole grains” for breakfast. I smiled and said that whole grains for breakfast were a Saturday morning treat. ps. Thanks for linking to my recipe for low carb porridge. It’s the same here – other mums are genuinely worried for my kids not eating porridge made with oats every morning and pity them for not getting juices on a daily basis! That’s so true! Healthy breakfast is key. I feel so much better when I don’t have sugar included in my breakfast- no headaches! These are great tips and ideas! I couldn’t agree more. Thank you Emily! I rarely eat sweet foods for breakfast. It’s usually just a bowl or oatmeal if I’m in a rush or if I have time, a savory type meal with beef bacon (I don’t eat pork) Your options are a great alternative. I really want to try my hand at granola. I know my kids will love it. I love savory breakfasts anyway so these ideas are perfect for me! Eggs rule – we all love our savoury breakfasts here! Such a good idea to start the day with a savoury breakfast and those pancakes look delicious, perfect for the weekend. Hope you’ll give them a go! These are great ideas for less sugary breakfasts! It’s so easy to not think about how much sugar a quick breakfast like cereal can have. I prefer savory anyways! Breakfast is my favourite meal, so I generally make it special by making something from scratch, high in protein and good fats. 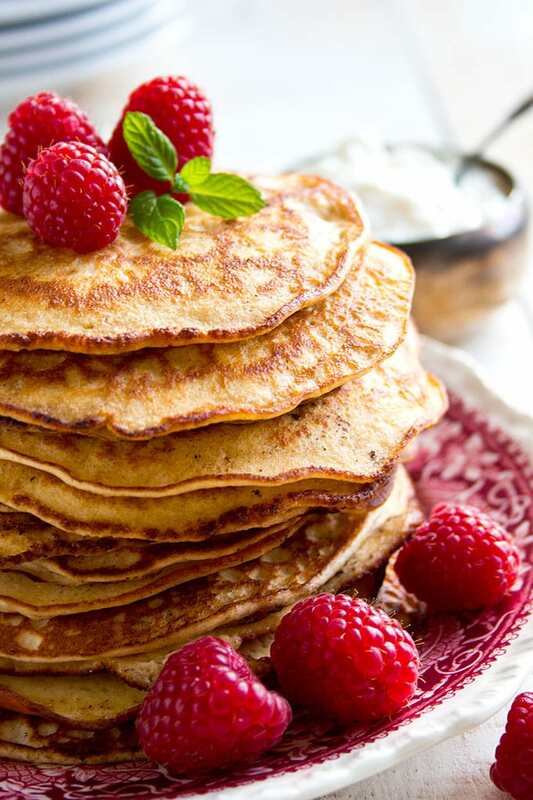 Those pancakes looks like the answer to brunch this weekend!! Yes there are lots of hidden sugars in foods. You have to carefully read the labels these days if you are at all concerned in what is inside the package. Healthy eating is a lifestyle all its’ own. I always try to focus on whole foods and totally agree with you that “if it comes in a box, it’s probably not that great for you.” Wonderful post, I enjoyed reading it! I love homemade granola. Such a great way to start breakfast. Thanks for all these options. It’s so easy to make your breakfast sugar free. You’re welcome! This is some great info to think about; it’s much better to nourish the body before satisfying cravings first thing every day. We too don’t eat cereal for breakfast. I cannot handle the amount of sugar in it. For a treat we will let the kids have cereal once every two weeks or so, but our savoury toothed daughter doesn’t even like it any more (she says it’s too sweet!). Eggs are always a great call! Very informative post. Starting the day off with sugary foods is bad, learned that the hard way with my little guy. Got that sugar high and then crashed. Now we try to make him savory nutritious breakfasts! I love your healthy options for breakfast. I need to try it. Thanks for sharing! Such important points! I am really aware of what I feed my kids, but it can be so easy to plop down something with sugar, like cereal in the morning. I am tired and we are rushing. But, eggs are a big hit and can be scrambled pretty quickly. I have never made the Coconut flour porridge, that is a new one for me to try! Coconut flour is super delicious. Hope you try it! Sugar free breakfast? Count me in! I’m all for eating healthier and cutting out excess sugar, especially if you can still have a tasty breakfast! Sugar intake can get out of control if you don’t pay attention to how much you’re consuming. I started following the rule that if the ingredient list had a form of sugar in the first three ingredients then put it back! That is a very sensible thing to do. Thanks for sharing! Calories are fine, if they come from fat, like your greek yoghurt. Fat is filling, and you will need smaller portions to be satisfied. You’ll fuel your body for longer. Thank you for this post, Katrin! Most convenience breakfast foods are just awful! Its no wonder our children struggle in school! Thank you for giving some healthy options! A similar study was done here about the ridiculous amounts of sugar in those breakfast cereals. 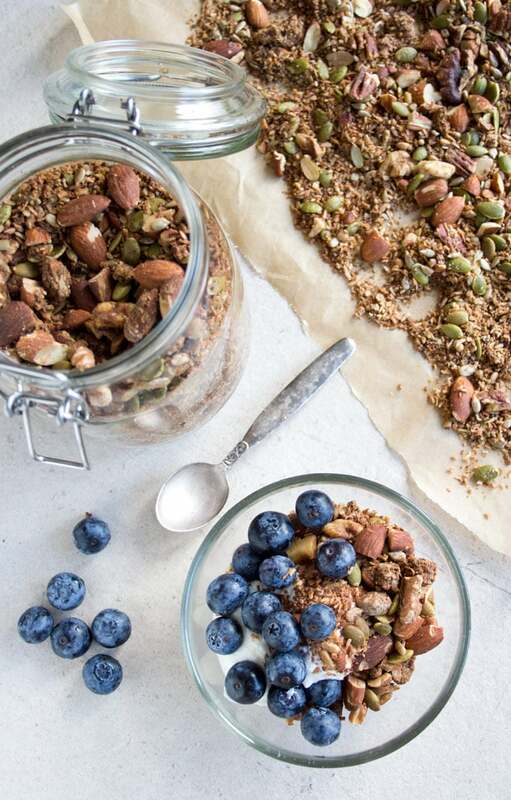 We haven’t bought one in years, we just make our own granola, though we are far from being a sugar-free household. And always yes to pancakes! I think there should always be room for a treat – this is real life, after all. Your suggestions all sound wonderful. I wish I could get my husband to eat more veggies at breakfast. He’ll do it if I make a veggie omlet, so that works for me. I really need to ditch sugar all together. I consume way too much of it over the course of my day. It makes me feel sluggish and crave even more sugar! This is great advice! I regularly eat meat leftovers for breakfast in a low carb wrap! That’s a great idea Georgina! Thanks for sharing. You’re so right about not starting the day with sugary foods. If I start with that, then I’m super hungry the whole day. If I start with protein and quality fats, I stay full so much longer. I find a little bit of sugar at breakfast wreaks havoc on my body and I have to spend the entire day trying to recover from it. Because of this, I generally eat a protein rich diet, low in carbs. Of course, when I am treating myself, I will whip up a batch of flour free protein pancakes make with Banana. . .just as good as the average breakfast and certainly way more tasty than boxed cereals. With some forethought, breakfasts like this are definitely the way to go! I think savory vs. sweet is more delicious anyhow!